Selenium is an essential trace mineral and antioxidant that is vital to good healthand physical and mental energy. While it should be found in many foods, the amount of selenium in common sources has decreased in recent decades. Here’s six different selenium deficiency symptoms and a simple and tasty way to avoid them, while potentially bringing more energy back into your day at the same time. Why Selenium is ImportantSelenium is needed to form selenoproteins, which are themselves necessary for the creation of glutathione peroxidase. Glutathione peroxidase is your body and brain’s master antioxidant and detoxifier. It converts various cellular toxins into harmless by-products for elimination and provides vital protection against many dietary and environmental hazards. Specifically, increasing glutathione peroxidase levels is believed to help prevent cancerous cell changes in your body. Some studies have shown supplementing with selenium may reduce your cancer risk, especially lung cancer, colorectal cancer, bladder cancer and prostate cancer in men. If you are selenium deficient and increase your glutathione peroxidase production by getting more of the mineral in your diet, you’re also likely to reduce your risk of cardiovascular disease. This is due to the way glutathione peroxidase reduces oxidative stress that leads to blood vessel damage and selenium deficiency has been linked to an increased risk of heart disease. Though both heart disease and cancer can have many causes and many different antioxidants may also reduce your risk of these diseases, it is still worth factoring in selenium as a necessary nutrient for a healthy heart and a lower risk of cancer. Did you know what are the symptoms of potassium deficiency? Check here. 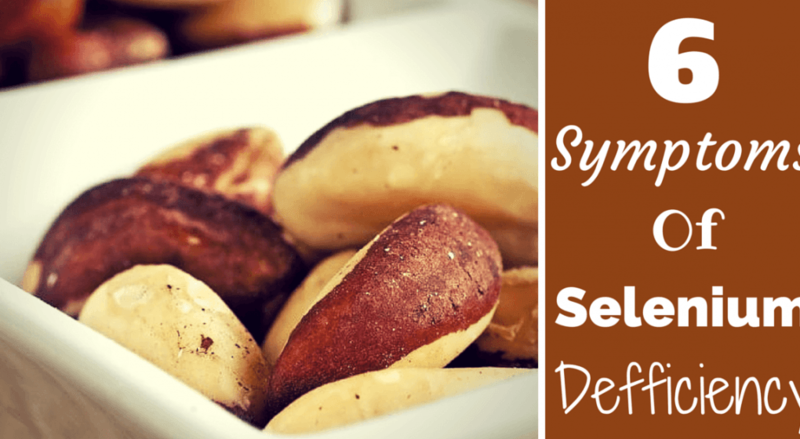 Let’s have a look at some of the more specific symptoms of low dietary selenium and how to avoid them. Hair loss that comes on relatively quickly and is evenly distributed may be a sign of selenium deficiency. In severe cases, even under arm hair and body hair can be affected. Importantly, too much selenium may also cause similar symptoms. Skin discoloration and particularly the fingernails, with heavy whitening of the fingernail beds often reported, are also signs of chronically low selenium intake. As detailed above, selenium is needed for your body’s master antioxidant glutathione peroxidase. Without a good production of this substance, you are likely to have low defences against colds and flu and other viral infections. Low immunity is a known sign of inadequate selenium and research has shown increasing selenium intake can improve immune function when body stores aren’t at an optimal level. While it’s true there could be many causes for ongoing fatigue, including a lack of B vitamins like pantothenic acid, or being low in other minerals like iron, selenium deficiency can also be the culprit. Unusual lethargy, tiredness and a lack of energy over several days could all be symptoms and it would be worth getting tested for vitamin and mineral deficiencies by a knowledgeable health care professional if you are experiencing ongoing diminished energy. Reduce mental function with poor ability to concentrate and recall information has been associated with a deficiency in selenium. Supplemental selenium has also been reported to help with anxiety, irritability, mental fatigue and even some cases of depression. Low selenium may be a factor in reoccurring miscarriages according to some studies. Lack of this trace mineral can also cause changes in menstruation for women. For men, a deficiency in selenium can harm sperm motility, therefore reducing male fertility. 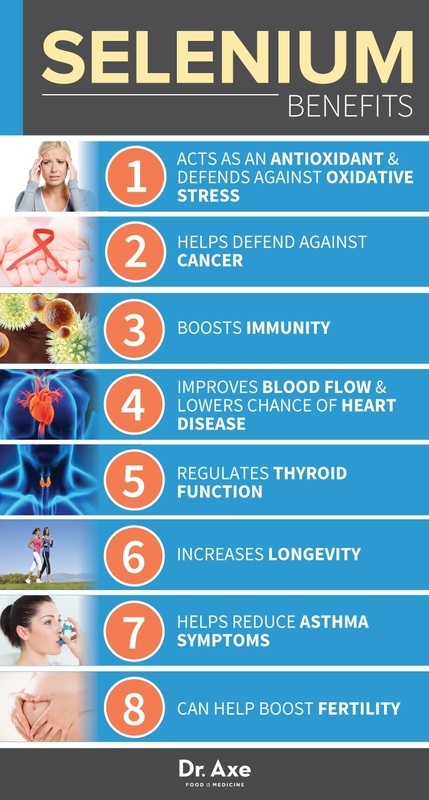 While this may seem like a good thing to some men at certain stages of their life, there are more useful natural treatments like papaya seedsthat don’t have the same negative health consequences as missing out on selenium. Chronic cases of selenium deficiency can lead to hypothyroidism. This is a serious health disorder where your thyroid doesn’t produce enough hormones and fatigue, depression and weight gain often result from this condition. There’s much more on how selenium can help improve your thyroid’s function here. There is some debate over just how much selenium we should be getting in our diets. In the USA, the RDA for selenium is 55 mcg for adults. In the UK, recommendations are 75 mcg for men and 60 mcg for women daily. While the World Health Organization has a complicated formula for working out how much selenium you require to avoid being deficient. It looks likely that there a significant health benefits in getting more than just the bare minimum amount of selenium set by the USA RDA. Keep in mind though that selenium can be toxic at extremely high intakes. Some suggest toxicity at 40 times the American recommended daily intake, though it would be a good idea to stay well below that. Under 400 mcg is often suggested as a safe level to keep selenium intake below longer term. Seafood like shrimp, sardines, salmon, halibut and tuna are all a great source of selenium (though consider using chlorella for the last two of these for the potential mercury issues). Crimini and shiitake mushrooms are a particularly high sources of yet another nutrient in selenium as well . Free range turkey and chicken, grass fed beef and pastured eggs all contain selenium. While barley, oats, brown rice, sesame seeds, sunflower seeds, broccoli, asparagus and spinach are all good vegetable sources. Far and away the best source of selenium though is Brazil nuts. These rich and creamy nuts have around 50 mcg of selenium in each nut and some have been measured as high as 90 mcg. Just two Brazil nuts a day can easily cover your selenium requirements and they make a simple, tasty and surprisingly filling snack. I’ve personally started eating them every evening to prevent late-night snacking and have noticed a boost in my energy levels since I started. I like these organic wild Brazil nuts and a big bag kept in the fridge lasts for at least a month eaten like this. Remember though, only two, possibly three a day, at least at the start. While Brazil nuts are very filling and most people would have trouble eating much more than a handful, even having more than six at a time might be too much for sensitive individuals. They are that powerful. Have you tried using Brazil nuts or selenium supplements for any of the health conditions listed here? I’d be interested to hear anyone’s experiences with selenium deficiency and how they overcame it.